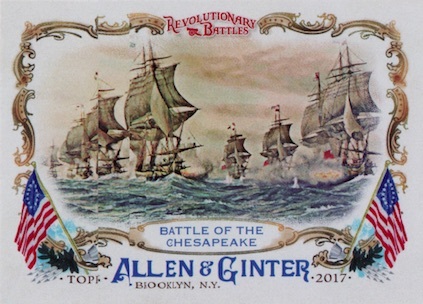 A yearly throwback favorite, the 2017 Topps Allen & Ginter Baseball checklist continues its eclectic run with collectors. Falling three per hobby box, hits come in a variety of forms including autographs, relics, book cards and rip cards. 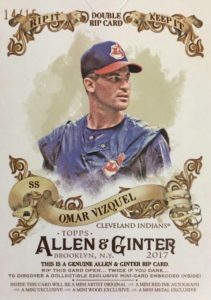 Highlighting both MLB players and the non-baseball champions with an oval frame, the standard 2017 Topps Allen & Ginter Baseball base set totals 300 cards along with 50 Base Short Prints (1:2 packs) that fall in every other pack. 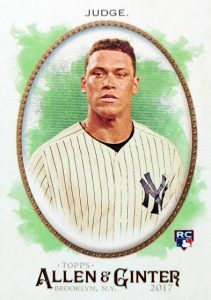 Regular-sized parallels include Hot Box editions, which only come in Ginter hot boxes, as well as one-of-one Glossy versions. Combining to drop in every pack, 2017 Topps Allen & Ginter Baseball is also offered in a smaller size. The A&G Mini parallel cards average 1:5 packs and are joined by the more limited Black Bordered (1:10 packs), Brooklyn Back (#/25), Framed Cloth (#/10 - Hobby), Wood (1/1 - Hobby), Glossy (1/1), and Framed Printing Plates (1/1) mini parallels. 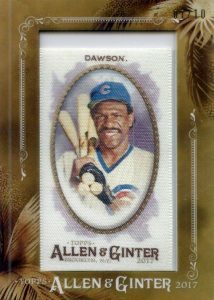 The hobby-only A&G Metal (#/3) mini is a partial parallel that covers 150 subjects in the base set. Home to the MLB stars along with a normally diverse assortment of non-baseball subjects, the Framed Mini Autographs insert is filled with up to 100 options, all signed on-card. Black Frame versions are limited to 25 copies while the Red Ink parallel, of course, signed in red, is only found in hobby boxes. Much more rare are the Cut Signatures (1/1) for 20 historical and political figures. Other signed cards include the Autographed Relic Book and Dual Autographed Relic Book inserts, each numbered to ten copies or less. Part of even more hit possibilities, 2017 Topps Allen & Ginter Baseball also offers up to 120 different Relic subjects with two different designs. Taking that a step future are Framed Mini Relics for up to 50 MLB players, along with as many as 20 Framed Gems & Ancient Fossils, and ten Framed Fictional Figures Relics cards. 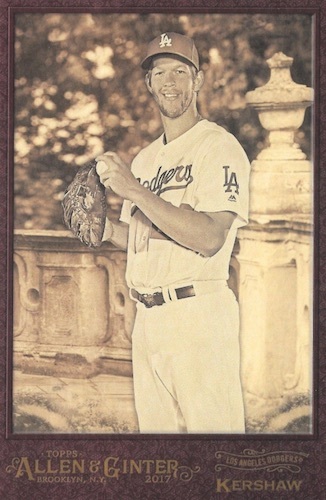 Hobby-exclusive Framed Originals (1/1) inserts contain authentic A&G cards of the past. Another staple of the brand, the vexing Rip cards return in 2017 Topps Allen & Ginter Baseball in base and Double Rip versions. The real treat can be the unknown card within. 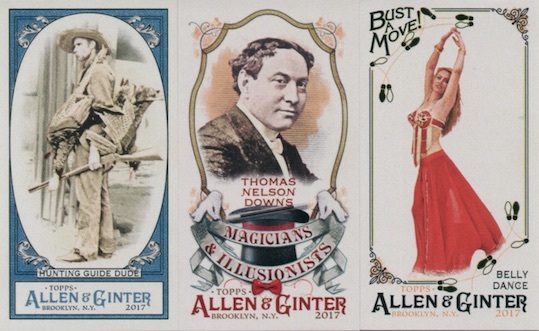 Part of an exclusive lineup, 2017 Topps Allen & Ginter Baseball Rip cards could include Artist Originals (1/1), Mini Metal (#/3) or Mini Wood (1/1) cards. 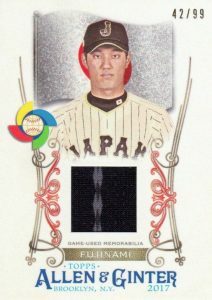 Another Rip choice, the Mini Exclusives inserts build on the mini base set with cards #351-400. 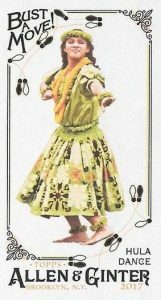 Just like any A&G set, 2017 Topps Allen & Ginter Baseball also presents quite a few full-sized inserts. Revolutionary Battles focuses on the American Revolution while Sport Fish & Fishing Lures takes aim at the water-based sport. 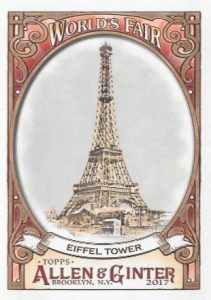 In addition, World's Fair looks to innovations and landmarks centered around the events and What a Day! returns the coverage to baseball with 100 cards honoring key MLB moments. All these inserts combine to fall 1:2 packs. Working with non-baseball themes, mini inserts average 1:5 packs. Taking a stab at the most popular dances, Bust a Move! is joined by notable star clusters in Constellations. 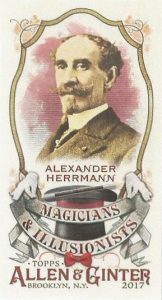 Other mini inserts include Required Reading from the high school days and Magicians & Illusionists. Applying a global spin, the aptly named World's Dudes documents 40 different "dudes." 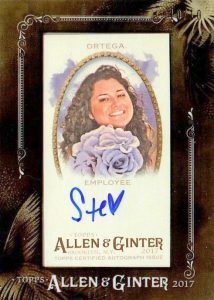 Finally, box loaders are only found in hobby boxes of 2017 Topps Allen & Ginter Baseball. These toppers are issued in base, Autograph (#/15), Autographed Relic (#/5) and Cut Signature editions. Exclusive to retail formats, Gold Bordered mini parallels exist for the base set while Horse in the Race documents notable thoroughbred subjects in a miniature insert. One of several '17 sets to find game-used World Baseball Classic memorabilia cards along with Dynasty, Museum Collection and Topps Now WBC, A&G is home to to two exclusive options. Only found in hobby formats, the Full-Size Relics (#/99 or less) insert highlights 30 global studs while the Framed Mini Relics (#/10) set covers ten top WBC subjects. 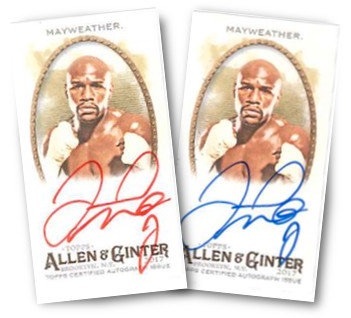 Update (6/21): Topps revealed that boxer Floyd Mayweather is included in the 2017 Topps Allen & Ginter Baseball checklist with both base cards and autographs. 2017 Topps Allen & Ginter VASHTI CUNNINGHAM AUTO. TRACK & FIELD ATHLETE. 350 cards. Cards #301-350 are short prints (SP) - 1:2 packs. PARALLEL CARDS: Hot Box Foil (Ginter hot boxes), Glossy 1/1. MINI PARALLELS: Gold Border (Retail), A&G Back (1:5 packs), Black Border (1:10 packs), No Number, Brooklyn Back #/25, Wood 1/1 (Hobby), Glossy 1/1, Framed Printing Plates 1/1. 150 cards. Serial numbered #/10. Shop on eBay. 150 cards. Serial Numbered #/3. Hobby Only. Shop on eBay. 43 cards. View our detailed guide and gallery. PARALLEL CARDS: Black Frame #/25, Red Ink #/10 (Hobby). Serial numbered #/10. Shop on eBay. 42 cards. Serial Numbered #/10 or less. Shop on eBay. 17 cards. Serial Numbered #/10 or less. Shop on eBay. Not on final checklist. Serial numbered #/10. Shop on eBay. 13 cards. Serial numbered. Hobby Only. Shop on eBay. 111 cards. Shop on eBay. 10 cards. Serial Numbered #/10. Hobby Only. Shop on eBay. 30 cards. Serial Numbered #/99. Hobby Only. Shop on eBay. All inserts combine to fall 1:2 packs. Up to 100 cards. Serial Numbered 1/1. Hobby Only. 1:6 packs. Continuation program that inserts Topps cards from earlier sets. See full details in our guide. 90 cards. Serial numbered #/60. Shop on eBay. Some numbers are missing in the checklist. 45 cards. Serial numbered #/10. Shop on eBay. All box loaders are exclusive to hobby boxes. Good: Interesting variety of topics covered; great primary design; lots of little things make it stand out compared to other sets. Bad: Too much reliance on basic relic cards as hits; non-baseball signers getting away from champions focus. The Bottom Line: A fairly polarizing set, A&G is an annual event that tries to walk the line between baseball and everything else. If you like great-looking cards and appreciate a diverse mix of non-baseball coverage, 2017 Topps Allen & Ginter Baseball is a viable option. But, as most of the unique aspects are quite rare, many collectors can’t stomach the chance of a $100+ box delivering three relics as the only hits. A&G is all about the retro experience, and it clearly accomplishes that in my eyes. The cards have a great feel in your hands, with a sturdy stock and slight finish on the front. As far as the base design, I’m still not 100% sold on the oval frame. I feel like it makes the cards look too repetitive since they are all cropped the exact same. A positive for me is the more simplistic A&G logo. I also like that the player name now sits above the player image so that it does not get lost at the bottom. Allen & Ginter is always good for a mix of inserts, and 2017 is no different. Standouts include the glow-in-the-dark Constellations, which could have glowed a little more but still caught my eye, especially since I initially thought it was a blank mini when I pulled it. I also thought it was amusing that Bust A Move! minis come with specific dance instructions on the back. 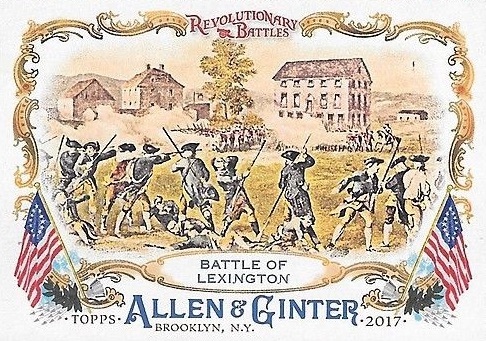 Military history buffs will likely appreciate the Revolutionary Battles set, and I particularly like the painted images. A&G seems to be one of the sets where despite regular tweaks and updates, the set still sort of looks and comes across the same. I guess that is a double-edged sword because while it has good brand strength, it struggles to make an individual mark each and every year. One thing that never really changes is the main autograph design. The thick, floral frame houses a mini autograph with an on-card signature. They look nice and are a staple of the product line. While I see the logic in continuing this style, I think the main relics need an overhaul as they have gotten stale. I do appreciate the ornate box topper design this year and think it is a massive improvement from 2016. 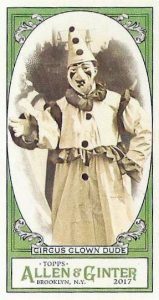 You may not like everything in the 2017 Topps Allen & Ginter Baseball checklist, but I would wager nearly everyone, and not just baseball card collectors, can find something that interests them. While it may not be a strong enough reason to buy the product, it is impressive if you think about it considering the ability of most other card sets to draw people in from outside the core demographic. A set collector’s ultimate challenge (or nightmare), the 400-card base set includes 50 short prints and another 50 RIP-only minis. When you take into account all the inserts, including the 100-card What A Day! and 45-card World’s Dude minis, it is no small task. One of the more scrutinized components each year is the non-baseball signers list. As far as what he has done in the ring, Floyd Mayweather Jr. is a massive inclusion and perfectly represents the non-baseball champions that A&G is associated with. Laurie Hernandez of Olympic gymnastics fame is another top option. You would think Topps could include five or so Olympic champions each year given the number of events and frequency of the games. Where the product loses some people is based on it becoming more of a pop culture set. William Shatner, Nick Jonas, Freddie Prinze Jr. and Sarah Michelle Gellar all have drawing power, but do they really fit here? And then there is the glut of sportscasters which have assumed a majority role in the lineup. When you have a box that runs about $115+ (at the time of this review), and it only guarantees three "hits," value can be a lot harder to achieve. If you pull three relics, monetary value likely goes out the window. Maybe Topps can make it one guaranteed autograph and one or two other hits per box. And while I think the autograph set is stronger than last year, it could still use better depth or some pruning. However, there is considerable value with some of the signed cards (Jeter/Judge/Mayweather), and A&G also provides more value opportunities in the non-signed stuff, which most sets can’t offer to the same degree. An important thing to remember is that while the rare cards are very, very hard to pull, they do add value even if they seem silly. As such, it is always good to go back through the cards a few times to make sure you did not miss something. 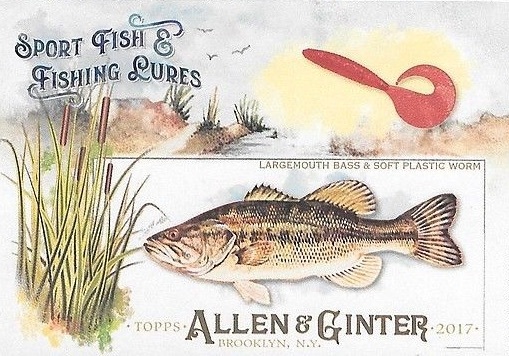 It may not be for everyone, but I normally like Allen & Ginter. It seems to transport you much more than other sets and that experience makes it more fun for me. Part of any product is knowing where to draw the line, which can be more of an issue here since there is really no line. Where else can you pull cards about history, fishing, or even actual gems, fossils, and “relics” from fictional characters in an MLB set? 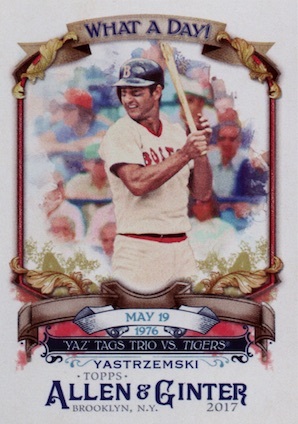 Some want their baseball sets to just be about baseball, but I think this concept is fantastic given that most other Topps baseball sets are, of course, baseball-only offerings. Because the coverage can shift so drastically year-by-year, the excitement can rise and fall accordingly. For me, the overall takeaway is an up year. 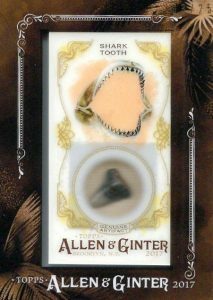 Considering Allen ginter ripped me off with a rat bone for a 1/1 redemption, I’m done with this set. 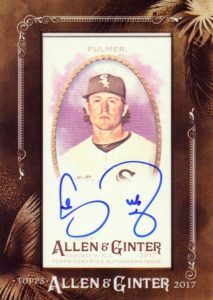 I’m still waiting on redemptions from Allen ginter from 2013 and no reply from Topps or any respect. So it’s hard for me to ever give a good review when Topps no longer cares about its customers. 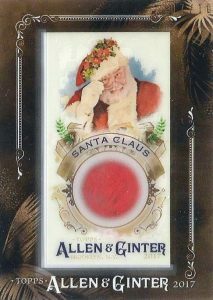 Allen ginter has always been a favorite with my wife and I till recent releases. I actually have a wife who loves to collect and to be treated by Topps as we have, we will no longer spend our time collecting with Topps. A rat bone???? Topps pretty much said what it feels about us……..Rats! So here it is, a bad review of another release. No reason to open rip cards anymore and tired of buying a case and only getting 5 autographs. Good bye Topps…….. I wish they would put more Boxers and UFC cards. I don’t like or care for all the gimmick card, such as a 1/1 rat bone, wth? But will pick up a couple of boxes and hope for the best. My favorite product of the year hands down. I’ve been buying these hobby boxes since 2012. The old looking cards with the twist of celebrity autos. Definitely a product Topps separates from the rest of their inventory. Now that Money Mayweather is included, only gets more intriguing. Good job Topps. Please just fix your correlating problems. Museum Baseball was a disaster. The question is if Bellinger will be in the set. He is in Bowman Platinum. The nxt quest is will Judge and Bellinger be sp. I hope not. After last year, which was a pretty good set, just waiting to see the autograph checklist. Loved the Roman coins last year too, can’t wait to see what’s in store ofr this year as well. Good price on a fun product. Chase is on and have a good time! Rolland Woods does have a point. Rat bones and waiting years for a redemption. I have had the same redemption problems. You pull the redemption and they don’t have it. WHAT !!! They should have the redemption before they put out these cards that don’t exist. Im sorry im not trying to only be negative! 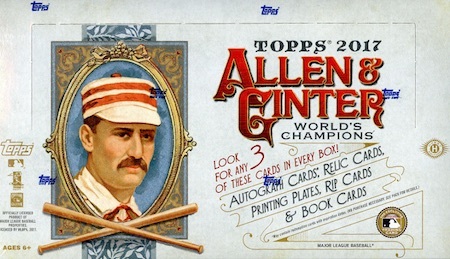 My wife used to love to collect with me and she has nothing to do with allen ginter now. Its not just the redemptions or the rat bone. But buying a case to break is just ending up unsatisfactory. Were spending $1,000-$1,200 on a case and only get 5 autographs and 29 plain white relic cards. Were not expecting booms but no reason we still cant get 1 auto per box concidering most of the autographs are low end. Our best luck is just saving up and buying singles online. Be honest, theres no reason to even rip a rip card now. Even the extended minis from rip cards arent numbered. 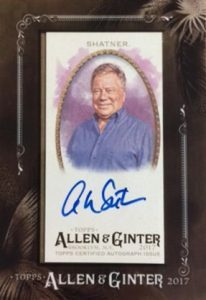 Ive always loved allen ginter but weve seen so many beautiful cards pulled from previous years theres no reason were getting a rat bone as a 1/1 redemption. I sold mine to a kid who love science and made his day. 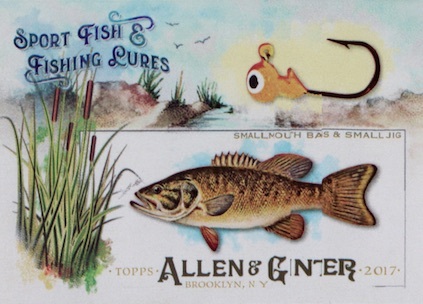 What happened to the amazing rarities once included in allen ginter. Rolland,you make many good points. I feel Topps has slipped some, when the checklist come out I look at them. The autos. and relics are about 97% worthless if you catch one of the really hot players you have something. It seems to me that Topps carters only to the E-bay sellers. Sadly Topps may end up like upper deck and Panini will have it all, if they loose their MLB license it is over. I would hate to see this happen due to their long history,but who knows? E-bay drives the prices way to far with case breaks, we all know that way too many of these prices are out of line $100 plus for ginter “way out of line for what you get”. I hope they wake up. 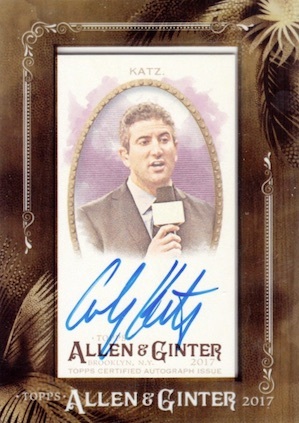 I always looks at Gypsy Queen as the poor man’s Allen & Ginter, but Topps did a phenomenal job with GQ this year, so I can’t wait to see what they did with A&G. A&G is quirky and fun – with cloth, metal and rip cards for my guy, I’m very much so looking forward to this product, as it scratches an itch that nothing else can quite get to. I can’t wait for cardboard connection to post the CL so I can see what everything is numbered to. No Cody Bellinger RC again. 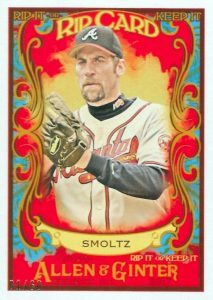 You can add them to a Walmart only product but screw your shop owners by leaving him out of Ginter and Stadium Club. I’m sick of Topps. Whats a ginter hot box? Brad, read the checklist section and it will explain the hot box info. Another boring looking card design again. They should just call it studio. May I ask how much was received for the 1/1 rat phone? 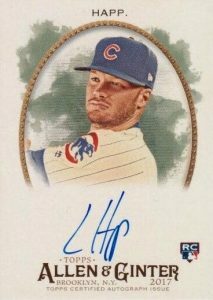 I also agree with everyone, that topps needs to guarantee an auto per box for the price point. It just makes sense in todays world. Make the $1.00 eBay jerseys harder to get and add patches!!! Also, remember that we the buyers are the reason why the box prices are high this year. I balked when I went to my local hobby store the day stadium released and they wanted $123.00 plus tax $130.00. for a hobby box. I told them no way I am paying that much for a box that had a suggested $72.00 a few months ago. 65.00 dollars for an auto😨😨😨😨. Really… geez, i can buy big name hof’s autos on eBay for that price. Surely there is not a judge auto in every case. Remember, that the dealers have to sell the product to recoup thier money to buy future products. So, if we are not buying then they will be a lowering the price to get thier money out of the product. Very few shop owners can sit on every product that comes out. 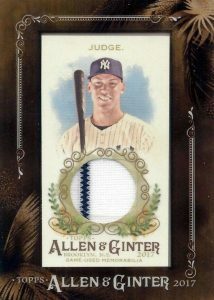 That said, if you want a judge auto just buy one on eBay. Last l looked, you could get a nice judge numbered auto for under 200.00. Doesn’t make sense to me to pay 90.00 for a donruss hobby box. Chances are very slim you going to pull it in 2 boxes. Hope this helps you out and remember to just walk away and say I am not paying that much. Sorry, Topps, but I will have to pass once again. More of the same, another crappy set loaded with pointless inserts, crappy relics and nobody autographs–and for a hundred and forty bucks, no less! And let’s not even mention redemptions. I still cannot figure out why you cannot fulfill my 1/1 2017 Inception Andrew Benintendi Book Auto Logo Man card, when the player signed over 500 other cards in that product–or even how you can get away with selling IOUs. Simply baffling. You ran out of ideas years ago. Done with cards. I would only player break this sucker if affordable. Too many losers and not enough hits. Allen gints are awesome. good product quit whining. And what cards do you like??????? Box arrived today. No autos. 3 Relics were Yelich, Felix Hernandez, and GM dan Jennings. Also 4 rediscover topps. Topps way of getting rid of old cards. And like always no Judge base card. Same issue year in and year out with A&G. Break a case and get maybe 4 or 5 autos. Other than that, receive $2.00 relics with the hope of a RIP card. Prime example below. Price is right – fun to chase! Box, got a sportscaster relic, some celebrity fitness instructor auto & a base Molina game used. Bunch of junk. Anyone that rates this over Gypsy Queen is crazy! This should be like $49.99 a hobby box with the tiny chance you have of getting any decent hit. And now a #d ratbone??? Maybe next year one of the hits will be a # card filled with a Topps executives cr*p as that seems to be the way they are headed and feel about their customers! Love it as always. I love collecting the historical stuff. As a lot of people say, I could do without the C-listers, but still love it. I got 5 ‘Rediscover Topps’ cards per box, so in a way you could say that’s 5 less cards you could have gotten towards building your set. Also, 2 of the boxes I got had the EXACT SAME World’s Fair cards. Bad luck, of course, but still a bummer. I got a ‘Hot Box,’ the first box I opened, and I didn’t know about it; i thought the whole set was shiny. 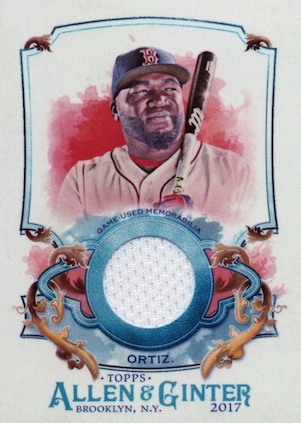 I just don’t know the difference between the 1/1 and the ‘Hot Box.’ Inserts and Top Loader not shiny, just base. 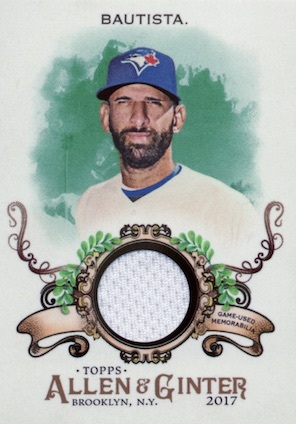 Also, I got a Bautista 1/10 framed cloth mini, and on the back it says “MADE IN CHAINA.” Yes, ‘chaina’ not ‘china’. Interesting. Way to many, compared to last yeas set. The auto check list is pretty good although, already pulled a Bellinger out of my first six boxes. Love the design, throwback theme, and the inclusion of non-sports. HATE the “Rediscover Topps” cards…I have enough 80’s & 90’s scrubs already! And they waste space for cards I might need! Got 4 boxes, 3 duds with only avg relics and a couple one buck autos (Lopez, Musgrove), got lucky with Judge auto redemption in the 4th. And one sportscaster per set is enough, holy cow. For 120/box, it’s waaaayyyy too costly for the value you may get or do get. I just opened a box of 2017 A & G and got two mini Mike Trouts, both have the A&G backs, but one is number 10 and the other has no number. They have different Code at the bottom also. CMP024935 & CMP024937. The latter has NO NUMBER. Any Idea ???? 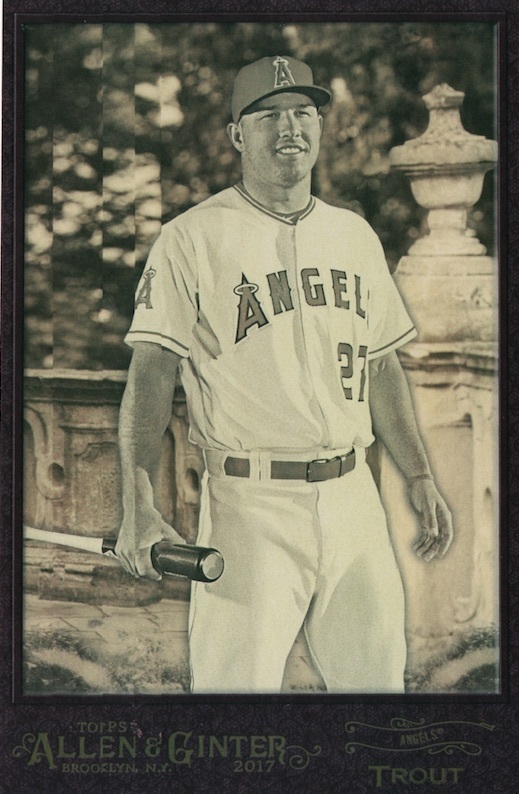 Mario: Sounds like the base mini and No Number mini parallel for Trout. Was not going to collect the set, but bought 2 packs and just fell in love with the cards. The design reminds me of 1958 T FB, 1959 T BB, 1972 Sunoco stickers. Great white card stock (little different from last year), I feel like I am holding a mini painting in my hands. AG tops GQ this year. The only redeeming quality about this set is the card design. I opened 7 blaster boxes and should have stopped after 1. Highlights were a few sp. I didn’t go in expecting a relic or 1/1, but was a couple of autos to much to ask? As far as set building, plenty of doubles and triples. Overall very disappointed. Additionally, way way way way way way way way way way way way way way way way way way way way way way way way way way way way way way way way way way way to many non-baseball related cards. I’ll invest me $$ elsewhere, right now I think KENO in Vegas has better odds of a decent return. 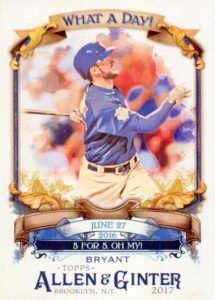 For the longest, I looked forward to A&G’s release every year, but until Topps does some major overhauling on it, I done with it. I know they’ve always had odd stuff to pull, but they’ve gotten to the ridiculous/stupid point. 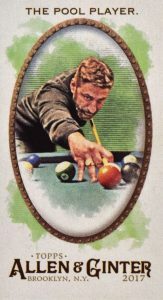 Who in the hell wants to pull t-shirt relics and autos of a dang sports writers, radio DJs, computer game champion, and other BS. Just because Topps lost their fb licenses to Panini, doesn’t mean they have to take it out on collectors by ramping up the trash input. You’d think Topps would be trying to better their product, instead of running off the collectors. Too bad I didn’t listen to others about A&G this year, could have saved a little money, and purchased something worthwhile. Thanks Topps for ruining what use to be an awesome product. Quit thinking more about the $$$, and less about the collectors. Bet you’d make a better profit if you did. I thought I’d wait to comment. So, here I am. I am a collector, not a flipper eBay pirate. Just wanted to get that outta the way. I am a A&G fan. No question. Love the quirky stuff. This year, however, I MUST be the unluckiest guy on the plant. There can be no other explanation. Purchased 9 hobby boxes (split between 2 hobby stores), collectively, and 15 blasters (from 3 different stores). Wow… holy base, Batman! No one can expect to hit anything beyond a ‘napkin relic’ or a ‘who cares?’ auto in blasters (still a long shot), I (we all) get that much. But c’mon? Two black border base… annnnd, that was it. Not even a Judge base rookie. Sort of had to laugh about that. At myself… For my stupidity. Now, as for the hobby boxes… absolutely nothing of note. A Brooklyn back of a near-future used car salesman MLBer. 3 boxes in a row of more base napkin relics. A few “who is that?’ autos (checked online, and they’re nobody). 5 (yes, five) Kyle Seager base box toppers… that has to defy some odds? Ha-ha. Anyway, look, this is not a sour grapes review, in the least – if you take it that way, what can I do? Nothing. So what can I do? C’est la vie. I like the A&G design. Despite its yearly repetitiveness. But geesus, Topps… if the price points on everything are going to keep jumping, you’re going to have to do better than this. No, each box doesn’t need to have an /10, /5. etc. 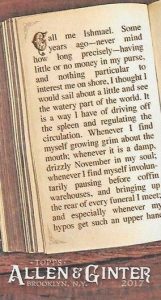 But the now most loathed ‘napkin relics’, the flooding of “who the heck is that” autos?… wow. Just wow? I think we should get a complimentary slap in the face with each purchase. I agree with the folks above who say, better get something rolling, or else the MLB/MLBPA licensing is going to wind up with Panini. Your really weak post-Crytozoic Walking Dead series aren’t going to save you. Wouldn’t want to see your offices wind up like O-Pee-Chee in London, Ontario… repurposed. Or, your name sold off to Upper Deck… *GASP*! Gotta do better for your customers, Topps. Much better. I got a 1/1 of Joe Louis autograph, the boxer. They are great cards, I think. However I have had pretty decent cards. Who am I to complain about this set. I opened my hobby box to find out it was a hot box and hit a mayweather autographed frame card. My box had 5 hits. Lucky draw I guess. I used to enjoy A&G. This year’s set had more sportscasters than it did Milwaukee Brewers in it. It’s helped me give up on modern cards. Hey Trey. 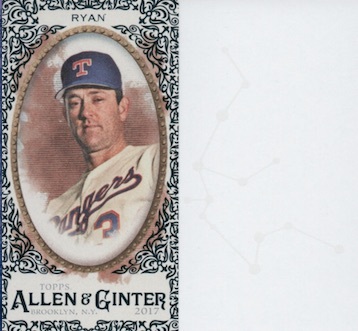 Since Topps now have Blaster boxes of these Allen & Ginter cards could you add the details/odds & packs per box for these Blaster boxes in the Product Details section? eBay is now loaded with sellers of these Blaster boxes so additional information for these boxes would be greatly appreciated. Thanks. Hi Tony, I don’t have the blaster odds. We stick to hobby because if we try to include everything, it becomes a mess. Hello again Trey. You mention that you don’t add the odds for Blaster Boxes but you have Blaster Box odds listed for other 2017 products/cards. I know Hobby Box odds are almost always provided(if available) but I’ve personally seen many Blaster Box odds listed on here from the Product Details section for quite a few releases. So, to say that you all only stick to hobby is not actually accurate. Thanks. I said we stick to Hobby, which is accurate as I never said that was exclusively the case. However, the Hobby format has always been the focus of the site. Retail odds are occasionally listed but that is not the norm. Quirky and Fun. The look great and feel great.